Ah, road trips. There’s something wonderful about loading up your car with only your most necessary belongings. You end up finding out what you love most when you’re packing your choice possessions into a limited space. Of course, saving room for your camera is a must, too; you’ve got to take pictures along the way after all. As we lose the speed of summer in the Northern Hemisphere we tend to think vacation season is over. It’s not. In fact, even with the collective sigh of summer’s end, you must know fall is a wondrous time to take a vacation. And New York State is an ideal place to do so. 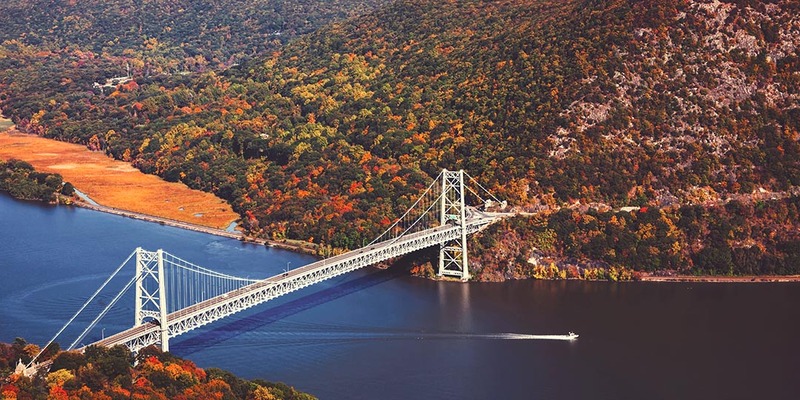 If you’re on locum tenens assignment in the Empire State, or if you plan to take a medical job here then be sure to consider its stunning countryside as the backdrop for your fall vacation. It’s full of amazing sights. Hudson Valley comes to mind. Here you’ll get leaves of gold. This scenic drive is on National Geographic Traveler’s Top 20 Must-See Places on its “Best of the World” list. Ask a New York resident about where to road trip and they’ll mention Route 20, too. This cross-section of America is reminiscent of yesteryear. The road itself began construction in the early 20th century and was finished around the 1950s; you’ll see sights like cobblestone houses, whitewashed barns and fields of hollyhocks. Of course, with every road trip, you’ll be held spellbound by all those endless painted white lines along the way. They tend to serve as a reminder of unabashed freedom; they’re part of the heavy memories that make up life on the open road. And each time you step foot outside the car to witness the magnificent sights we’re about to detail below, you somehow become lovesick, desiring to have your foot on the gas pedal again, pining to drift freely past countryside and take in as much scenic stimulation your senses can handle. Welcome to the striking byways and highways of New York State. Stretching from the Adirondacks all the way to the Statue of Liberty, the Hudson River defines Upstate New York. It’s an iconic refuge for New Yorkers. Historic towns rife with storied pasts, riverfront parks, old diners, you better believe you're in for a real treat traveling down this road. Hit up Kingston if you’re looking for an intimate look into New York’s past. (It was the state’s first capital before Albany.) The Stockade District is where you’ll want to head first; you can witness fascinating Dutch architecture here. Or if you’re more inclined, get out on the river ASAP with Rip Van Winkle, a family-run, river-cruise company. Red Hook Diner (AKA Historic Village Diner) – A 1920s-built diner just north of Rhinebeck. Walkway Over the Hudson – Stop in Poughkeepsie to walk across the world’s longest pedestrian bridge. Mohonk Mountain House – Quite expensive to stay overnight but it’s worth it. If you don’t have the time then opt for a less-expensive day pass and visit the grounds – a Victorian castle resort sits atop a brilliant mountain lake. There are plenty of hiking trails and swimming spots to explore here. As mentioned before, locals will probably tell you to drive the distance on Route 20 because you’ll be met with unparalleled scenery. Not many people outside New York State know about Route 20 as a scenic byway. Most people might think of the Finger Lakes or Hudson Valley or even the Great Lakes Seaway Trail as far as the really great New York drives. But Route 20 should be up there, too. We bet you’ll be recommending it to friends soon after you make the drive yourself. Stop off in Skaneateles for a lakefront-rich adventure. You can see the town’s namesake lake right from Main Street. There are remarkable little boutiques and antique shops here – plus a slew of great diners. There’s no other reason to stop here other than to view the splendor of one of the prettiest towns in all of New York State. Chittenango Falls State Park – Just north of another quintessential New York town – Cazenovia – is Chittenango Falls. Take the roughly 0.5-mile gorge trail up to the 167-foot waterfall for spectacular views. Fly Creek Cider Mill – In the town of Fly Creek is a cider mill that has been pressing the most delicious cider ever to grace anyone’s taste buds for the past 160 years. Don’t miss out. Notoriously known for serving as an inspiration for F. Scott Fitzgerald’s book, The Great Gatsby, this ocean drive is, in a word, transcendent. You drive this stretch and you feel instantly transported back 100-plus years, as if you’re in the Gilded Age looking from afar witnessing in wonder all the glory of a glistening party at Eagle’s Nest (the Vanderbilt’s Spanish Revival mansion). But that’s not the only thing that’s magnificent about this drive. There’s a whole world going on inside Long Island’s Gold Coast. Start at Sands Point Preserve, once the mansion of Harry F. Guggenheim, for some truly great views of Long Island Sound. It now serves as a natural history museum, as well as a nature preserve and historic site. Nassau County Museum of Art – 25 miles east of New York City rests a 145-acre property filled with formal gardens, art exhibitions and a world-renowned sculpture garden. This is the height of Long Island’s famed Gold Coast. Vanderbilt Museum – Gone are the days of raucous parties. Now the Vanderbilt Museum hosts a 3,000-year-old mummy along with clear views of Northport Harbor and Long Island Sound. It’s also a marine and natural history museum. And a planetarium, too. Take a cruise aboard the Discovery – You probably didn’t think you could take a wetlands cruise in New York, did you? Well you can. And this hour-and-a-half-long tour runs right along Long Island’s North Shore, aboard a pontoon boat. Now that we’ve detailed some of the best scenic drives and top sights in all of New York State, what’s next? First things first, find more can't-miss drives and tours here. Second, are you looking for a locum tenens assignment in New York State? Look no further. We have opportunities for physicians all across this great state, just click the orange button below to search for a medical job that suits you. You’re also welcome to give us a call; our physician placement specialists are here to help.